It was not so long ago that consumers learned they could buy some things at Target and some at Tiffanys. Maj. Gene Hogg, the Salvation Army’s commander for central Maryland, organized mobile kitchens after the twin towers fell in Manhattan and the levees broke in New Orleans. He fed protesters and police officers during the riots that erupted here in 2015 after a young man named Freddie Gray died of injuries he received while in the back of a police van. More than 200 businesses were destroyed, many of them places where people bought food. Ms. Miller, a marine-mammal biologist who has a big vegetable garden and likes to bake, opened Nada after she saw how much plastic waste was choking the oceans. “It was a leap of faith,” she said. About 300 people showed up — more than she expected — to shop in the 2,332-square-foot store on its first day. Business continues to beat projections, and Ms. Miller has fielded more than 100 calls from people all over the world who want to know if she plans to franchise or who hope to open their own version. The couple’s young daughter has epilepsy, and they discovered early on that a healthy diet could help her feel better. They couldn’t find enough local, organic items at the big-box store close to town, and the nearest co-op was 20 miles away. 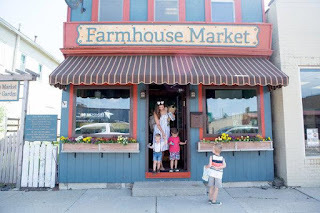 So, almost three years ago, they opened Farmhouse Market. Ms. Rasmusson, 34, works part time as a marketing consultant and is the primary caretaker for their three young children. Her husband, 40, commutes 90 miles round trip for a banking job in Minneapolis. They calculated what it would take to open their own store, and realized the numbers wouldn’t work if they were to run it in a traditional way. There just weren’t enough customers. Then, inspired by a nearby 24-hour fitness center, they had an idea: Why not create a store that didn’t need staff, for shoppers who wanted organic ketchup, gluten-free crackers and vegetables from local farmers? Members pay $99 a year and use a key card to open the door. They can shop anytime they want. The system runs on a series of iPads and other devices. Lights are motion-activated, and checkout is done on a tablet. Local farmers, beekeepers and other suppliers have cards, too, so they can restock their supplies at midnight if they want. Ms. Rasmusson prices items from home, and texts orders to suppliers. Members can use a space upstairs for community meetings, or hold classes on making kombucha or Spanish for children. And the store is not completely unmanned. It is open to the public nine hours a week, with an actual cashier. The Rasmussons don’t worry too much about theft. They can monitor the store, which is only 650 square feet, with remote cameras. Inventory is tracked digitally, and they have a one-theft-and-you’re-banned-forever policy. Membership is up to 275, and Ms. Rasmusson has been invited to speak at rural food conferences, where people ask if her model or something similar — like the stores Amazon is testing in Seattle, where an app records purchases as the customer leaves — could work in rural areas. More than 80 people from around the world who are interested in opening a version of her unstaffed store have contacted her since Farmhouse Market opened. “I tell people we just pieced it together and dug in and figured it out,” she said. In Baltimore, the Salvation Army market is tackling an urban version of the grocery-store drought. The DMG Foods was built in the front of a Salvation Army distribution center in a neighborhood where families in public housing mix with Johns Hopkins students and older people who grew up there. Many eat at a nearby McDonald’s or a KFC, or walk a quarter-mile to the Giant Food. People around here tend to shop for groceries a day at a time, Mr. Hogg said. Budgets don’t allow for big, weekly shopping trips to stock up, and many residents lack a car. The cheery store, whose name is an abbreviation of the organization’s motto, Doing the Most Good, feels a little bit like what Amazon would ship if you typed “grocery store” into the search bar. And in a way, that’s what Mr. Hogg did. The equipment, from the checkout counters to the meat cases, came from another Baltimore community-minded grocery that opened in 2013 but went out of business. The stock comes from C&S Wholesale Grocers, the nation’s largest independent grocery distributor, which gives Mr. Hogg a discount. The grocery cost $2.2 million to set up, and his operating costs are low because the Salvation Army handles human resources and some other business operations. The power company takes a quarter off the energy bill. Donations and grants pay for education and training. The store is intended to serve as a work-training site, and Mr. Hogg is planning cooking demonstrations to teach shoppers how to eat better. There are baskets of free fruit for children. Still, the store has plenty of chips and sodas. “You can’t tell people what to eat,” he said, and choice is a matter of dignity when you’re poor. So is the simple act of shopping. “There’s something about saying, ‘I buy my own groceries,’” he said. He and the managers are learning what customers want. They added Goya products, fresh ginger and tofu, which is popular with college students and older shoppers. Bagged salad mixes didn’t sell, but prepared ones did. They added fried chicken along with rotisserie chickens, which at $4.99 are cheaper than at other grocery stores. People from the neighborhood who stopped in one day in July said they didn’t expect the store to be so nice or so inexpensive. “At first, we were like, ‘What is this?’” said Jamie Rogers, 31, who was shopping with her sister, Stephanie Rogers, 29.
her only $8. At Giant Food, she would have had to pay about $15, and she would have endured a long walk there and back, she said.